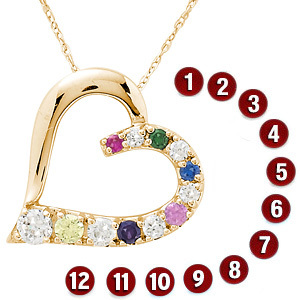 This heart-shaped pendant always features 12 round brilliant gemstones. Stone details: 2 x 1.25mm; 4 x 1.7mm; 3 x 2mm; 2 x 2.4mm; 1 x 3mm. This item includes a free, matching 18-inch rope chain in 14kt yellow gold. Item dimensions: 17mm x 17mm, slightly smaller than a dime. One of few options on the market for multiple stones to create "family" jewelry. This is a lovely heart shaped pendant just right in size, neither too big nor too small. I used all 12 stones for the members of my family and a CZ for God as our head. It was beautiful and stones were correctly placed. I had been concerned about the stones showing up well because of the small size especially on the top but those were pretty well visible and lovely. The peridot (2) were both on the small top end and barely reflected the light green so I would recommend light color stones being placed maybe 5 stones down from the top curve of the heart to be more clearly visible.